It goes without saying that Easter is the most joyful Sunday of our Christian year. Unless, of course, you’re herding toddlers, teenagers, or turtles to church on what is ALSO the busiest and most crowded Sunday morning of the year. But stress no more! By following these simple guidelines, your First Church Easter Sunday morn will be a basket of bliss! For 8:00 am services, arriving at 7:30 am will allow you plenty of time to park and get inside. For 9:30 am services, arrive around 9:10 am to give those who attended the 8:00 am services time and space to exit. For 11:00 or 11:11 am services, arrive between 10:40 and 10:50 am to make it easier to find a parking place and avoid the entrance/exit gridlock. All parking lots surrounding the church are available on Easter Sunday. Look for the Volunteers who will be directing traffic to find a space quickly. Complimentary valet parking is available between 7:40 am and 12:30 pm for those who need to save a few extra steps. Enter from 7th Street and proceed through the Main Lot to the 5th Street ramp near the Garden area. If you’re a First Church regular, consider parking in the Extended or Foundation lots (see map) to leave spaces closest to the main entrances for guests, expectant mothers, people with disabilities, and senior adults. As you arrive, look for the friendly faces ready to greet you in the parking lot and inside our buildings. If you’re new and need help finding something, look for volunteers with the “Ask Me” badge. If you see someone who looks lost or whom you don’t recognize, introduce yourself and ask if they need help. We’re the Church for Children! Children and all their wiggles are welcome in worship at FUMCFW. Children 3-months-old – Pre-K can go to our Sunday Morning Nursery starting at 7:45 am. If you’ve never used the nursery before, be sure to allow a little extra time to get your child checked in. Children grades K – 5 can go to Children’s Academy Sunday School at 9:15 am. If it’s your first time, please plan to arrive at 9:00 am to get checked in. Youth grades 6 – 12 can go to the Justin Youth Building for youth worship and donuts from 9:30 –10:30 am. Easter Sundays at First Church always means a packed house in all our services. Please remember to fill the seats in the front rows first and, in all rows, scoot in toward the center to make room for everyone! First United Methodist Church of Fort Worth is located in the heart of downtown Fort Worth at 800 W. 5th St., Fort Worth, TX 76102. 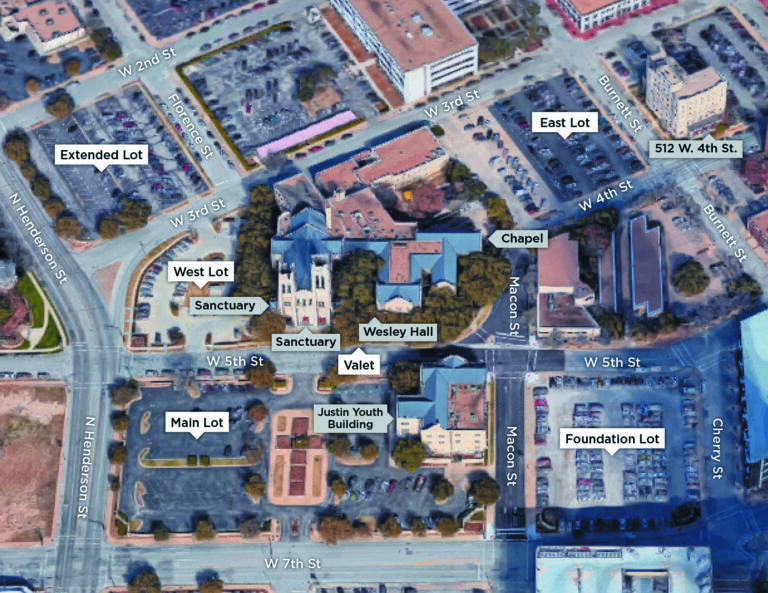 All parking lots surrounding the church are available on Easter Sunday.